Italo Labignan: After fishing the Red Sea and the Mediterranean, we headed East through Nazareth towards the Sea of Galilee and then headed north and went all the way up again to the border, almost to the Lebanon border to one of the farthest kibbutz and we explored some of the headwaters of the Dan and Jordan rivers. There are a lot of fish farms there for rainbow trout. A lot of the rainbows for one reason or another escape the areas where they are being raised into the river system. 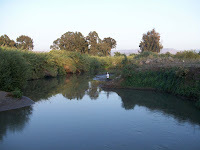 The fish raising operations use the water from the Dan or Jordan rivers as the source water. So when you are up there, these rivers look like beautiful glacial run-off rivers that are in Western Canada, pristine water, a lot of overhanging vegetation and on many of the kibbutz there are very large plantations of avocados and other trees so there’s lot of shade. In the water, the first thing that you do if you look in the tributaries is that you see barbels, these are a species of fish that are vegetarian so you cannot catch them by angling. 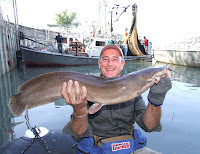 There are other species of barbell in the Sea of Galilee, the main one called the large-scale barbel, which is a delicacy for eating, and it is a very aggressive game fish. It will hit lures, spinner, spoons and will also take bait, flies and so on. You see those but if you come in the water you will also catch these rainbows using artificial lures or imitation eggs and so on. So that was in the north. 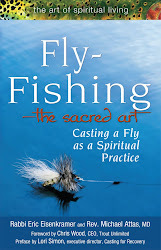 The Fly Fishing Rabbi: I heard that you can fly fish in the northern streams in Israel, in the Dan region, for trout, but I had also heard that fly fishing in those streams was illegal. Is that true? Italo: I am not very familiar with Israeli regulations on fisheries but I know that there are nature preserves and national parks in Israel and those are protected from taking fish or wildlife. I understand that and I think it is proper. But outside of the national parks, there are many sections of both the Dan and the Jordan River where the water temperatures are cool enough to support trout and other species of fish. 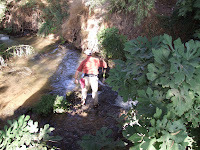 On Kibbutz property need to speak to someone and you can have access to a kilometer or two of stream. 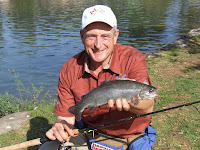 I encouraged the people in the kibbutzes, where they already raised the rainbow trout, to work with the government and stock rainbow trout in the waters that are on the kibbutz. If someone wants to fish the water, like other places in North America, they could actually fish quite a long section of the tributaries and fly fish or spin fish and catch and release or catch and keep. It would be legal to fish on a kibbutz with permission. Rabbi: Where was your next fishing destination? 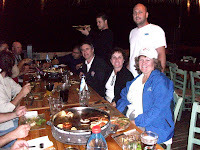 Italo: From there we travelled south and went to Kibbutz Ein Gev which is on the eastern shore of the Sea of Galilee. I went out on a commercial boat. I wanted to see, like the biblical fishing, when they were throwing the nets in the Sea of Galilee. This was using a net on a large scale and catching a whole bunch of fish. We caught most of the fish species that are in the Sea of Galilee and we did a segment from the boat catching everything from Chinese silver carp which can reach weights of 60 kilos, over 100 pounds, to some of the common carp species, to the large scale barbel, and different species of tilapia, which most of the people around the Sea of Galilee refer to as the St. Peter’s fish, catfish and so on. The government of Israel stocks the Sea of Galilee every year with a species of mullet that can grow up to about two kilograms. Even though they are salt-water fish, they do very well in fresh water. Then we fished right at the kibbutz (Ein Gev) and did a program on the catfish that have been introduced a long time ago by the British. Some of the catfish were up to 15 or 20 kilos that we landed. Many of them broke our lines because they are hard fighting fish. So we were using for bait freshwater sardines, those are the baitfish that are most common in the Sea of Galilee. Rabbi: I saw that picture of you with the catfish in the article on-line and it was huge! Italo: We have pictures of all the different fish in the Sea of Galilee that we caught but in the article there was only room for one fish. You talked about fly fishing in the north in the streams. Don’t forget that there are different species in the Sea of Galilee that you can fly fish for also. You can get the catfish by fly fishing! They are so aggressive that they will hit anything that moves. They not only feed on sardines, but using streamers that look like a three or four inch long smelt, alewife or sardine, you will have no problem catching catfish that are twenty or thirty pounds in size. In the Sea of Galilee there are also species of tilapia, also called the St. Peters fish, that we were catching on artificial lures, spinners and spoons. You could very easily catch with dry flies or poppers, because they are very aggressive, or with streamers, wet flies and nymphs. Then there is the large scale barbel which looks like a trout, which reach weights of about two pounds. These are very aggressive fish. If you find a school of these large scale barbel, whether you are using spinners or flies, you can get ten or twenty very quickly. They are like piranhas, as soon as one is triggered into feeding, all of the other ones want to hit the same thing. That’s from the shore line, anywhere there is a little bit of deep water, because much of the Sea of Galilee’s shoreline is tapered. In the last two years there has been a drought in Israel so the waters have receded. Some of the best places of fish from the shore, are where there are break walls that go out or where there is a harbor area, where the water drops off from let’s say from zero to five feet or ten feet deep in a short distance. That is quite common in different places, usually where the kibbutzes are and right in Tiberius. Those places where it is public, you can literally go off the rocks and start fishing, and sometimes you see the fish and you can cast right to them, sight cast. By the way, There is a carp association in Israel. They have a membership of about 20 or 30 anglers. They have tournaments on the Sea of Galilee for carp. Some Europeans travel over to Israel to compete. Italo: From there we headed south, quite a long drive, all the way down to Jerusalem. 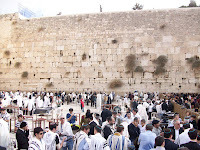 We stopped in Jerusalem to cover the culture. 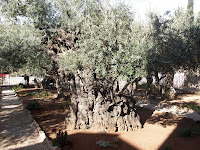 We went to Yad VaShem (Israel’s Holocaust Memorial Museum) and I did some segments in the Garden of Gethsemane, the Mount of Olives and the Old City. Italo's fishing adventure has certainly opened my eyes to the angling potential of the country. Some years ago the upper Jordan, specifically the Dan River, was a delight for trout on the fly- before it was discovered. Since then the meat hunters have sadly ravaged the river to troutlessness with their nets and spearguns. Now it is pretty much fenced off and shut down. I have since presented a workable program of restoration of the trout fishing there as a means of preservation, income, and sheer romance. The current philosophy of the Nature Reserve Authority here is that they do not want "exotic" species in the Holy Land, but wish to preserve the local suckers (elsewhere known as "trash fish"). So it goes. Nevertheless, I seriously planted the seed, and do believe that someday it will sprout and bloom. Some of the streams in the Mount Hermon area of the Golan are so cold and clean that I bet if even brook trout were stocked in them that they could survive. The Dan could be an excellent rainbow fishery if the government stocked it and allowed restricted patrolled fishing. From time to time ( very infrequently) people get 5 to 10 pound raibnow trout out of the Dan but I was tild that its illegal.